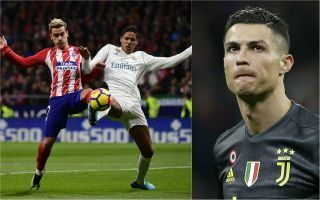 Cristiano Ronaldo is reportedly keen to see Juventus seal the transfer of Real Madrid defender Raphael Varane this summer in what could be a blow to the likes of Manchester United and Liverpool. L’Equipe recently claimed Varane was looking for a way out of the Bernabeu this summer, following what has undoubtedly been a frustrating season for him and most others involved with the club. Real’s form has dipped majorly, and Varane is one of many who looks like he could benefit from a fresh start elsewhere. It could be that that means the France international will head for the Premier League, with Don Balon recently linking him with Manchester United and Liverpool. However, the latest from Diario Gol is that Ronaldo is keen on having his old team-mate join him at Juventus. The piece does suggest, though, that this could be quite an ambitious move and that the return of Zinedine Zidane as manager of Los Blancos could hurt Juve’s hopes of signing the centre-back. That said, the Italian giants are so dominant right now with many recent big-name signings and not much in the way of strong competition in Serie A, that it would be tempting for players at most clubs to get in on that. Still, United will no doubt want Varane as a much-needed upgrade on players like Eric Bailly, Phil Jones and Chris Smalling, while Liverpool need someone more reliable and less injury-prone than Joe Gomez, with the likes of Dejan Lovren and Joel Matip not much in the way of backup for the Reds.